Plonk, as in "a bottle of plonk", as in "the cheapest wine on the menu", was, originally, a bottle of plinketty-plonk. And plinketty-plonk was, originally, just a humorous English way of pronouncing the French term vin blanc. Surely the word ‘plonk’ is onomatopoeic, being the noise made when a cork is withdrawn from the bottle? Which tells you something about the Daily Telegraph and perhaps about our post-truth world (did you know that that term post-truth was first recorded in 1992?). The Australian line makes sense as they have something of a history of wine-making, albeit a stuttering one. The early British settlers (voluntary and otherwise) didn't know much about planting vines, so in 1803 the Sydney Gazette and New South Wales Almanac printed some helpful guidelines that they had translated from a French manual. They included lots of instructions about what month to plant in, what month to prune in and so forth, which was was disastrous, as they had forgotten to adjust the French manual for the Southern Hemisphere and the eccentric Australian habit of holding summer in December. 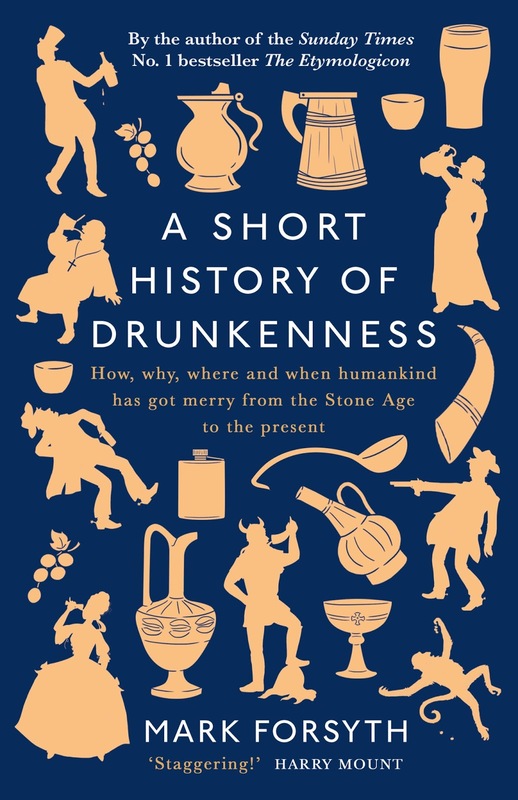 I know all this because I have written a whole book on the history of drunkenness called A Short History of Drunkenness, which will be released in Britain on November the second. It's a tour through the ages looking at how people went about getting drunk in different times and places. If you were in Ancient Egypt and wanted to get stinko where did you go? Who did you go with? What did you drink? How much did you drink? And how did drunkenness fit in to the culture and the mythology and all that sort of stuff. What was a Wild West Saloon actually like? Or a Viking feast? Or a medieval alehouse? Reading: A Short History of Drunkenness, @Inkyfool:Sulphuric acid in the gin? Highly suitable for Xmas! Many synonyms for "drunk." When greatness descends upon the earth and comes anywhere near me, I come over all giddy, and need a drink. A Short History of Drunkenness may, can, should and shall be purchased here. I'm sold! Thanks also for the sidebar mention of The Horologicon. While I would have never guessed there were enough words of this type to fill a volume, I'm glad to discover someone found them. Thanks for gleaning and compiling, Mark. I can’t wait! Your other books were some of the most enjoyable I’ve ever read. I appreciate your talent. Hi Mark. just picked up your book in San Francisco... superbly entertaining and interesting. There was one poem I particularly loved, but I'm having trouble finding it again... believe it was something about how beer is in nature... mind helping me out?